Membership Month is when we ask our community to step up and support CAGJ by pledging money or time. Please consider becoming a monthly sustainer or providing a one-time contribution of $15, $35, or $75. 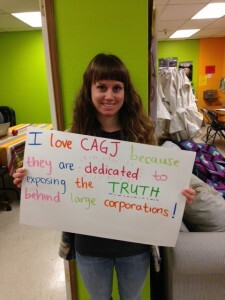 Almost all of CAGJ’s revenue comes from individual donations. Corporate Takeover of Africa’s Food: On March 23, 2015 the Bill and Melinda Gates Foundation and the United States Agency for International Development sponsored a secret meeting in London to promote a recent report they commissioned detailing in clear terms how to privatize the seed and agricultural markets of Africa- without African stakeholders having a seat at the table. CAGJ/AGRA Watch and Global Justice Now coordinated simultaneous actions in Seattle and London. KiroTV covered the event here: Demonstrators picket Bill and Melinda Gates Foundation. For more information see here. NO GMO Salmon: On March 7th, 2015 people gathered in front of the Seattle Costco to deliver over 50,000 petitions from around the country asking Costco to commit to not selling Genetically Engineered (GE) salmon even if approved by the FDA. We were excited to get excellent TV coverage with a spot on KiroTV a few days before the action! For more information see here. Our food system will not survive this global takeover without us intervening. Become a member of CAGJ today and let’s set this trajectory on a different path! This month we will also be highlighting the accomplishments of supporters such as yourself. 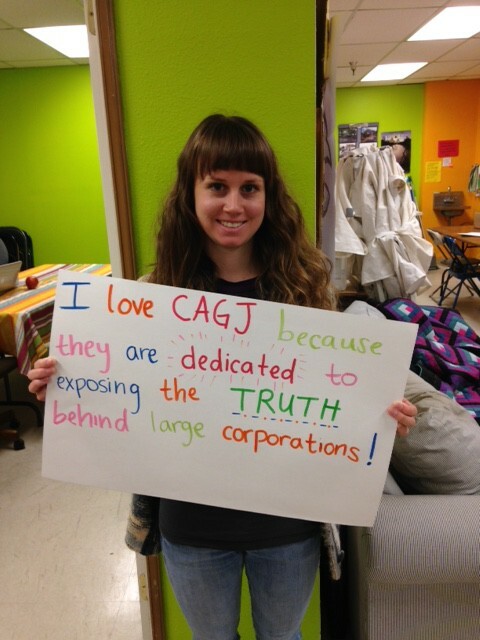 Please tell us what you love about CAGJ, and you may have your response featured on social media or our newsletter.